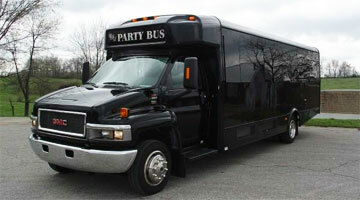 Party Bus Dallas TX offers cheap party buses throughout Dallas and surrounding areas. Dallas Party Bus Rental has something for everyone! Whether you are looking for airport transfer to DFW or a wild and crazy party bus in Dallas, no matter what type of transportation you may need, we are sure to have exactly what you are looking for. We are #1 in Texas! Football season is always a great way to enjoy our transportation services in DFW When you rent a limo or party bus in Dallas you can roll up to Cowboys Stadium and take tailgating to a whole new level. No matter what the weather is on game day you can tailgate with all your friends and family. Even during the off season there are always reasons to rent a party bus in Dallas, TX. Catch your favorite band or artist for one of their concerts at the American Airlines Arena, and continue your celebrations to some of DFW hottest nightclubs like Ghostbar, Plush or even Lizard Lounge. Size is never an issue when you rent a party bus in Dallas. Learn more about us! Needing a Dallas Limousine for your upcoming wedding? Not a problem you can click on the images on this page to get your DFW limo quote today. Click on the live chat button to talk to our live customer service representatives about any questions you may have. With our wide range of vehicles the options are limitless. Rent a Hummer Limo for your daughter’s upcoming birthday the smile on her face will always be remembered. 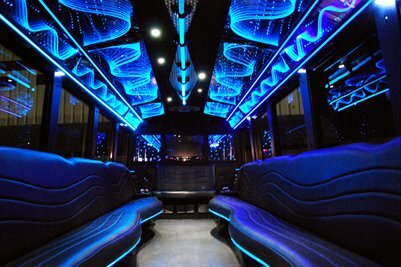 Party Bus Dallas TX luxury vehicles can hold up to 22 passengers and all have one of a kind interiors. Our vehicles are sure to blow your mind with some having hardwood floors, leather seating, large LCD TVs, MP3 connectivity so you can customize your playlist, and fiber optic lighting. 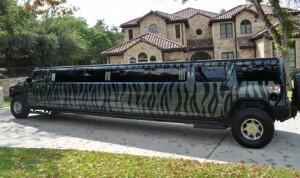 Surprise the kids with a ride in one of our Zebra Hummer Limos as you make your way to the Dallas Zoo. Check out some of the most amazing animals that are seen in the wild and see the animal that inspired our Zebra print hummer rental in Dallas. Is your son or daughter graduating high school or college? Show how proud you are of them by renting a limousine in DFW for their big night. Are you a coach for an AAU team or college team and need to get your whole squad in the same vehicle? Our charter bus rentals are perfect for you and your team. Let your team bond before and after the game win or lose. Want to take your kid to catch a MLB game? When you rent a coach bus you can take all your players to watch the Texas Rangers or Houston Astros hit some home runs. Want to show up to the arena in a Escalade Limousine and be just as flashy as the players. We have you covered with some of the most luxurious Escalade Limos in Dallas. With our cheap transportation luxury vehicles are not just for the sports stars or celebrities anymore. If you have a large group to entertain, consider a Dallas party bus rental. Party Bus Dallas TX also offers shuttle services to DFW and transfer services from Dallas Fort Worth International Airport. We have professional chauffeurs able to pick you up and take you to Six Flags Over Texas, White Rock Lake Park, or your hotel. With our Dallas Shuttle Services you can take your whole family in the same vehicle to your upcoming family reunion or family outing at the Texas State Fair. With plenty to do in the DFW area the reasons for our transportation is endless. Even if you need an DFW Executive Van for your upcoming meeting at the Dallas Convention Center. Have a mobile meeting before you get there to make sure all your staff is on the same page before you arrive. When you choose to go with Party Bus Dallas TX the options are out of this world. With affordable limousines and cheap party buses in DFW it is no wonder we are the go to place for all of Dallas transportation needs. If you need service in the Houston area check out our partner sites Party Bus Houston & Limo Service Houston. If you’re going to be in the Louisiana area you can get transportation services from Party Bus New Orleans or Limo Service New Orleans. Check out our fleet of luxury vehicles and get your party bus prices in Dallas today or feel free to click on our live chat button to speak with our trained customer service representatives. Dallas Party Bus Rental wants to be your go-to resource for all limo services.